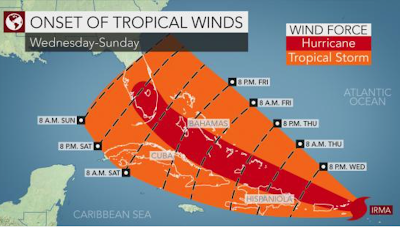 winds (40 mph or stronger) and hurricane force winds (75 mph or stronger). You'll recall yesterday that I mentioned (scroll down) the possibility of the storm turning and missing Florida? Some of the models show it to be more of a possibility this morning. If that occurs, it would be something like Matthew last year. Finally, a few of the models still have it missing the USA altogether. My "What Do I Do Now?" is not changed. It will likely change later today.